What Is Your Website Health Score? Why Is It Important? If you agree that your website is your number one salesperson, then the health of your website should be very important to your organization. That begs the questions: What does it mean to have a “healthy” website? What does a healthy site look like? A healthy website is more than just a good-looking site. Search engines like Google don’t index and rank websites based upon beauty; they rank sites in search based upon how well optimized they are. If your web pages are not optimized, it’s difficult for people to find you. Not properly managing your website health means you are missing out on many opportunities to rank higher on keywords that your potential customers are searching for to find your products and services. Mark’s Tip: Time and again, we see that customers with websites that have not been optimized suffer with the quality and quantity of organic traffic and leads to their websites. Optimizing a website is an ongoing process, not a set-it-and-forget-it strategy. 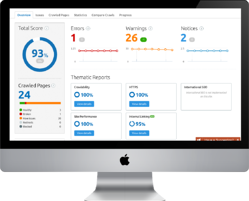 To check your site’s health, try our Website SEO Audit Tool. It's free! First, let's take a look at how a website health score is calculated. To begin, we start with a site audit. The audit determines the number of total errors and warnings that are found on your web pages. Most of these errors and warnings lead to a negative user experience and or web pages that are downgraded and banned from search results. Again, optimized web pages improve your search engine rankings. The result of the audit is a health score. To calculate the score, you need to look at the portion of URLs on your site that have errors and compare that to the number of pages without errors. This score is a metric that tells you the percentage mistakes on your site. These errors negativity impact your rankings on search engines. Mark’s Tip: It's important to understand that you may have 50% of your website pages with errors and within each of those pages there might be multiple errors. Depending on the size of your site, the total number of errors and issues could be in the thousands. Fixing these errors is a painstaking process. While many errors can be filtered and fixed in groups, some need to be fixed one at a time. Let's break down each one. Errors are issues of the highest severity. Here are just some examples. Pages with duplicate meta descriptions. Search engines don't understand which page to load when this occurs. Issues with mixed content. Web pages with http and https on your website. Duplicate title tags. Web pages what the same title tag or main heading. search engines don't know what page to load. Images that don't have alt attributes. Old images are used by search engines to understand the context of your image so that search results can display those images. Links on https pages going to http pages. Any link that points to an old HTTP version of a website confusing search engines as to which page they should rank. Pages that have low text to HTML ratio. This is the ratio of the amount of actual text on your webpage compared to the amount of code. your text HTML should be less than10%Text. The more text you have on your page the higher you will rank. Outgoing external links contain nofollow attributes. No follow attribute means search engines won't follow that link. You may be missing out on link juice and these might be Pages you want the search engines to find. Pages that require more than three clicks to be reached. Make sure that pages with important content can be reached within a few clicks. Pages have more than one H1 tag or main heading. More than one H1 tag may confuse users, as well as search engines. To understand what the health score means and how to interpret it, let’s look at a couple examples. Example #1: 100 total web pages crawled and 20 of those pages have errors. The health score would be calculated like this: (1 - (20/100)) x 100 = 80%. Your website heath score is 80%, nice job so far right? Not so fast. You’ll want to read the tip below because this number can be misleading. On the surface, an 80% score looks very good. It means the majority of your web pages are good, with only 20% having errors. But we have to dig deeper to determine whether the pages with errors have critical errors that impact the most important sections of the site. For instance, there might be dead links on those pages. These might be resources that prospects need to make buying decisions. Or, maybe these are critical pages about your products and services that can’t be found on search engines when potential customers look for you. Mark’s Tip: Regardless of your health score, the errors, warnings or notices on your web pages all negatively impact your SEO and user experience. As search engine algorithms evolve, and as your website changes over time, so, too, will your health score. A monthly exercise for a typical organization is 10 hours a month to keep up the Health Score of their website. The biggest takeaway from this article is that websites need to be maintained, just like cars or anything else that requires upkeep. As the web changes, and as your website gets updated, your site’s health scores will change. Website health scores decay over time. Not updating your website or optimizing your website will result in a negative impact through organic search results and or a bad user experience. 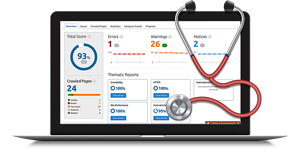 To really check your site’s health, try our Website SEO Audit Tool. It's free! What Is Iterative Web Design — And Why Is It Important?